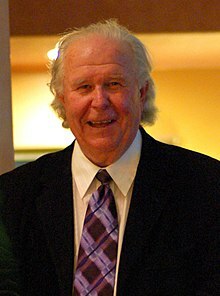 Ned Thomas Beatty (born July 6, 1937) is an American actor. He was born in Louisville, Kentucky. He is known for his movie work including Nashville (1975), All the President's Men (1976), Network (1976), The Big Easy (1987) and Prelude to a Kiss (1992). ↑ 1.0 1.1 "Ned Beatty". NNDB. Retrieved 20 February 2016. ↑ "Ned Beatty". Rotten Tomatoes. Flixster. Retrieved 20 February 2016. This page was last changed on 12 July 2018, at 15:49.